Promo Propeller that lifts off into the air.Attach the stick to the blade, place blade up in the palm of your hand, slide hands quickly in opposite directions, and watch the Propeller take off! 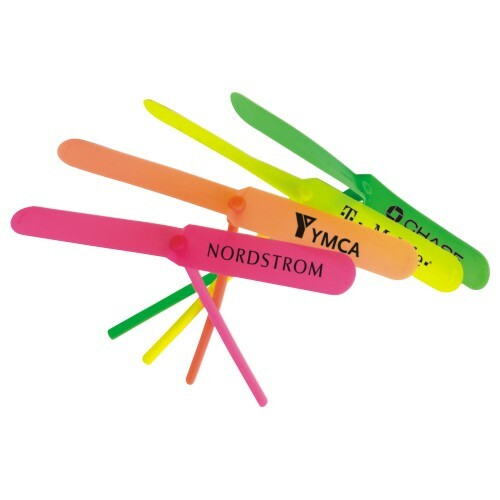 Send your brand flying after promotional success with these cool and fun promo propellers. Simply attach the stick to the blade, place the blade up in the palm of your hand, move hands quickly in opposite directions and watch the propeller take off! These come in assorted neon colors with your brand imprint for great eye-catching fun. Elevate your advertising efforts the easy way! Get started with your order today! Bulk / 22 lbs lbs / 250 pcs. / 18x13x13box.